Symbol PD8705 - Scanner (4/8, No RFID, Smart card, No Ethernet and POL). Requires power supply (Part# 810003-007R), not included. Requires key injection in order to accept debit or credit card payments. Please call for more information. 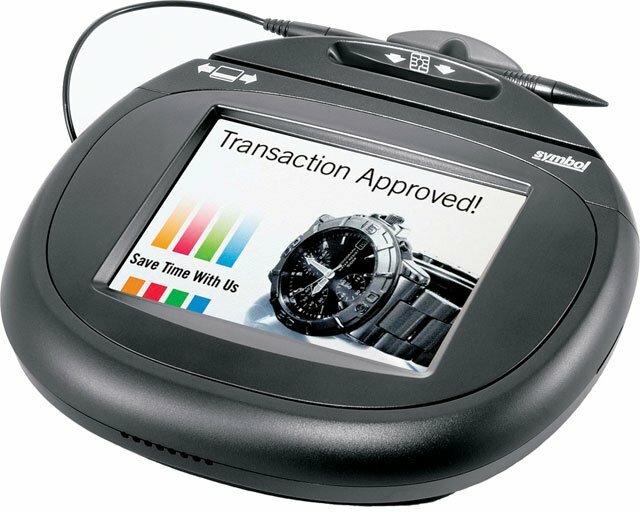 Symbol's PD8705 is a high performance, highly secure, interactive color payment device that not only provides fully integrated debit, credit, smart card and contactless payment capabilities, but also allows you to create customer-oriented, non-payment applications, such as instant credit, HIPAA compliance and digital advertising. The 5.7" backlit color display presents vibrant, high quality images that are easy to see in dim or well-lit areas, and the pressure sensitive touchscreen, which supports both finger and stylus pen touch, delivers both high quality signature capture and reliable PIN entry. PED-certified and meeting all industry standards and PIN entry requirements, the multi-functional PD8705 improves the customer checkout experience while it reduces transaction and payment-related costs. The Symbol PD8705-4C0S00 is also known as Symbol Technologies	SYM-PD87054C0S00	or PD87054C0S00	.